You can change your Blog Layout setting from the Customize menu (Appearance > Customize). You can change default layout from Genesis Layout. The default layout is : Content – Primary Sidebar. You do not need to change anything if you do not want to switch the sidebar position. Click Publish to save. Please note : Depending on the theme you purchased, not all themes have 3 columns layout. Change your content so it only shows the excerpts. The default setting is Entry Content (all your content will appear). Choose Display: “Entry Excerpts” to have automatic read more button in each post and make sure “Include the Featured Image” is checked. Image size : autoreadmore, image alignment : center. Click Publish to save. 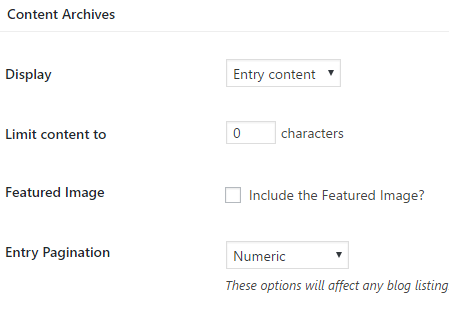 The Image below is the default setting of the Genesis Framework content archive. You will need to add the “read more” button manually.